So it has been a while since I have posted. Why is that? 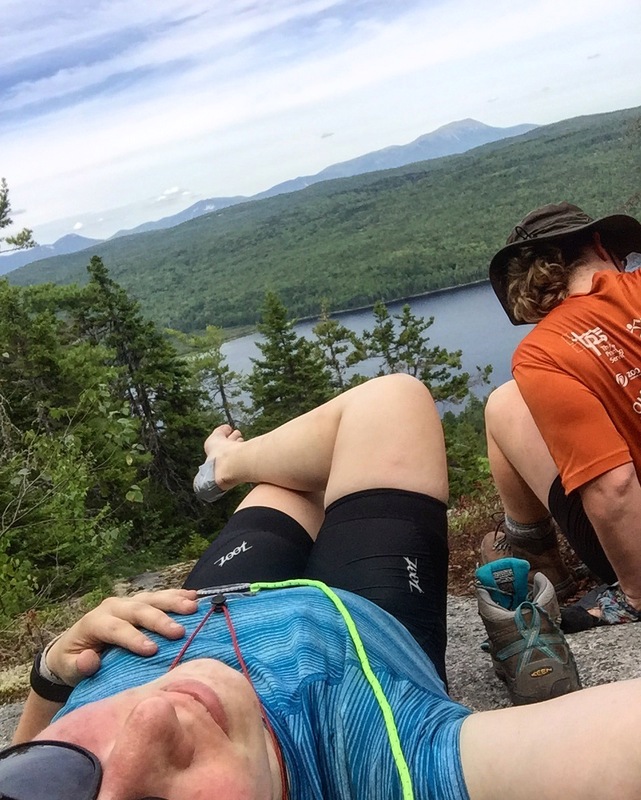 Well, we have been traversing the 100 mile wilderness and Mount Katahdin in Maine! So how has the first part of our adventure gone? After and incredibly long drive, lots of frustrating drivers, traffic, and many beautiful states later, we are settled and rest our weary heads in nice clean beds in Millinocket Maine. We have said our goodbyes, shed our tears, packed, repacked, and overpacked our bags and now eagerly, nervously, and excitedly await our start of the AT as official southbounders (or SOBOs as we are called for short). Here we come Katahdin! Tomorrow starts our big adventure and the start of my dream! Words cannot describe! 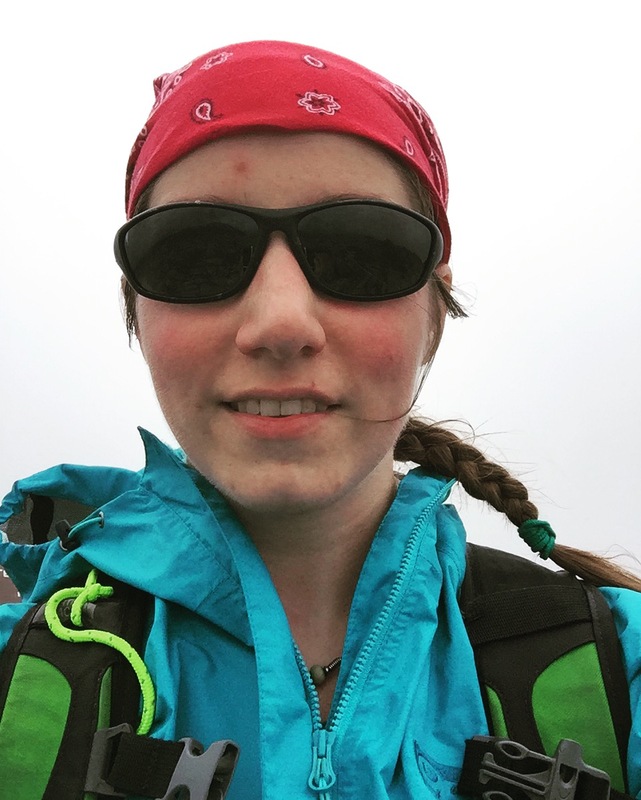 The mountains are calling and it is time for me to begin my dream, my adventure, my lifelong goal: to complete the Appalachian Trail! Nerves are at a high, we being today! We had a nice restful night at the AT Lodge, and are now sitting down to eat a great breakfast (the last for a while), with my Dad and Jess, at the AT Cafe. A northbounder, Spoon, rolled in and signed one of their ceiling panels. He has just completed his 2,200 mile journey as a NOBO! Congratulations Spoon! 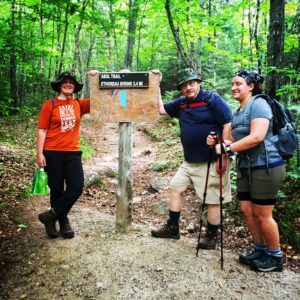 Dad became our first trail angel as he insisted on paying for our breakfast – thanks Dad – and now are on our way into Baxter State Park. As we pull into the park, a hawk drops down in front of my car and leads the way (what a great omen)! With a bit of a struggle, we managed to find the campground and ran into my good friend Adam. He informed us the weather report for the day was not good and the rangers were suggesting being below tree line before 12pm or 1pm. Yikes! Now the nerves have really kicked in because we are having a late start today and won’t be down before that time. 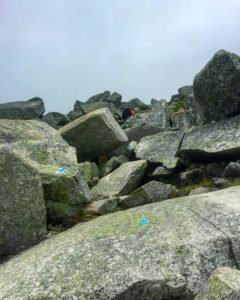 After some discussion, we decided that we would try to summit and watch the clouds and the winds to determine if we needed to turn back once we got close to being above tree line. So up we went! We ascended the Abol trail, with Dad and Jess in tow, and quickly took off up the beginning of the trail. As we approached the tree line, the boulders began and our ascent was slow and incredibly steep! We watched the skies and the clouds were to our south – we were lucky! The storm was passing us by! So we pushed on. After many scrambles and steep climbs, with tears in my eyes, we successfully summited Katahdin at 2:49pm! After the photo shoot, down we went, on the AT, official SOBOs! The skies were still promising as we started to descend the steeper climb down. Wow what a trick that was! In some sections, we had to hold onto a metal bar and swing ourselves around to slowly lower ourselves down an enormous boulder! Luckily, I have some experience with bouldering, because some of those skills certainly came in handy! As we were nearing tree line, the skies informed us that it was time to get down. As we were nearing tree line, dark clouds rolled in and rumbles began in the mountains to our south. CRACK! A thunder clap made us quicken our pace as we raced for tree line. We made it safely below tree line and managed to stay dry on the rest of our decent. 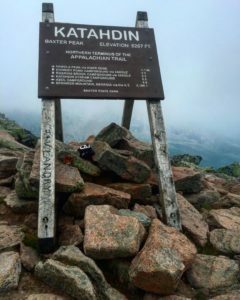 We reached the bottom of Katahdin with Dad, Jess, Adam and his wife and young girl all waiting for us at the bottom. Between my dad’s vertigo, and the storm rolling in, Dad and Jess had decided to turn around at some point of time during the day, and were unfortunately unable to summit. Adam and his family invited us over for a nice spaghetti and meatball dinner (they became our second set of trail angels) and we enjoyed an amazing cooked dinner with some wine (thank you Dad) before we turned in for the night, crawling into our tents at the Katahdin Stream Campground. What an end to Day 1! Dad, Jess, Adam, his wife Melissa, and his adorable little girl Liliana all saw us off today. Today is a good day as our terrain is relatively flat. We passed a natural water slide and took a quick and glorious swim! The weather has been ridiculously hot today and we are completely covered in sweat. As we neared the end of our day, we began to notice how uncomfortable our packs were due to excessive weight. We struggled into the campground and set up camp next to a wonderful woman, Kaley. What a coincidence! The whole reason Carrie and I got together to do this trail was because of our good friend Kaley who spells her name the exact same way! We all had a great laugh about that, while Carrie and I contemplated how much of a coincidence that was or if this was another good omen. This new friend, Kaley, invited us to use her fire and we sat down to have our first trail dinner and enjoyed sharing stories for a few hours. We attempted to hang our bear bags, rather poorly I might add, and started to explore our packs, looking for any way to drop weight that we could! We made some tough decisions and tomorrow we will deposit those items we feel we can part with to save some weight before we begin our trek through the 100 mile wilderness! Wish us luck! Tonight we sleep soundly at the Abol Stream Campground. Packs are a little lighter and legs are stretched out (I have gotten in the habit of stretching at night). We have a LONG day ahead of us today with many ups and downs and our packs are still heavy. Last night, I was awaken by the sound of a Loon on the lake we slept next to. Two loons on the pond. Through my day today, I have started to develop two blisters on the backs of both of my heels. I have tried moleskin and duct tape and will see if that helps. The mosquitoes are brutal and love me – the feeling is not mutual sorry – and one went as far as biting me on the arch of my foot last night! UGH! We arrived at the Rainbow Stream Campground, and set up tent. We are the first ones here. Continuing our tradition, Carrie and I (no real trailnames yet, though “Short-term” and “You Know” may be possibilities for me, we’ll see) took a swim in the lake close to our campsite. AMAZING! We met several awesome people along the trails today, some just doing the 100 mile wilderness, some flip floppers, and a few NOBOs. 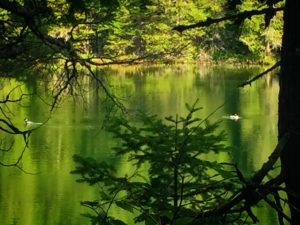 As we got ready to retire for the evening, I sat by the lake and watched two loons court each other and a family of what looked like loons dive and swim all over, riding the waves created by the winds. As I sat, taking in my surroundings and enjoying nature, I saw what looked like a small eel slithering through the water. It was a LEECH! Luckily for Carrie and I, none of them attached themselves to us when we swam earlier that day! My blisters have expanded to the size of 50 cent pieces on the back of both heels now. I am really struggling though this. 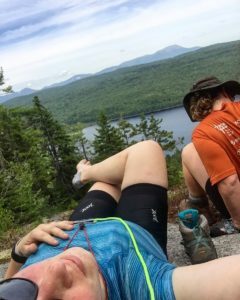 We took a break at what we thought was the top of one mountain (joke was on us there) but enjoyed some beautiful views as I rested my feet. As we dropped back to rest there, Carrie’s water bottle bounced down the mountain and off into some trees. Unsure if it was gone forever, she carefully traversed down the ledge and low and behold, there it was! Lucky day for us again! 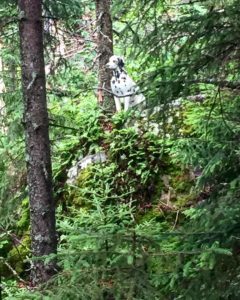 We started back up the trail only to find that mountain was MUCH taller then we thought! How deflating! I hobbled along and drained both blisters once we got into the Wadleigh Stream Lean-to. So far Maine has been beautiful but brutal all at the same time. The roots are endless and really abuse your feet. We decided to stay in the lean-to tonight and we will sleep in our sleeping bags exposed to the environment around us. Here we go. Last night, the little critters were running all over us. As I slept on my stomach, with my hands by my side, I suddenly felt a little. . . nomnomnom. A little mouse had nibbled on my pinky! That was enough of that, and my hands remained inside my sleeping bag for the remainder of the evening! As we break camp this morning, I removed my bear bag from the rodent hangs on the lean-to (little pieces of string with sticks that you can hang your bags to keep the rodents from getting in them), only to find two holes chewed into my bag! Those little stinkers! They had somehow figured out how to jump onto my bag and happily enjoyed some of my GORP and Kind bars! UGH! They left my breakfast and dinners though so that was nice of them. I hope they enjoyed their meal! Lesson 1 – don’t use the rodent hangs! I am still battling the blisters today. Every attempt to keep them under control has failed. Our third trail angel, Bright Side, donated the remainder of his Leuko tape, a tape meant to help fight blisters and help them heal. What a LIFESAVER! We immediately put that on our heels and it made quite a difference! Carrie’s feet feel much better, but mine are still killing me. I think my compensation for the blisters has started to put extra stress on the balls of my feet. The battle continues! We have a few nasty days a head of us so I am trying to keep my feet under control. Tonight, we stay at the Potaywadjo Spring Lean-to. The campsite we stayed at today was amazing! We had a nice waterfall and pool right in front of the lean-to so we took a water bath and did some swimming. What a relief! A group of 6 boys joined us at the lean to last night, but we stayed in our tents down by the water. Falling asleep listening to the waterfall was fantastic! I am still battling the blisters, but they are finally getting better. Feet still hurt but I am massaging and stretching them each night. We press on today and begin some more difficult days ahead. May one point today, we stopped at a lean-to to resupply water. As we regrouped at the lean-to and investigated the skies, we noticed the dark clouds rolling in. Just as we were debating waiting out the storm – CRACK-CABOOOM! A large thunder crash hit directly behind the lean-to. “Yup! Guess we’re waiting it out!” We waited at the lean-to for one hour while the thunder rolled on and the rain down poured. At one point the hail came pummeling down! After the storm we moved on and ran into several other hikers who had gotten caught in the hail storm. Our luck continues as we managed to stay dry the rest of the day and arrived at the copper brook falls. Carrie and I have been passing lots of NOBOs, flip floppers, and 100 milers, but no other SOBOs yet! We may be some of the last few! 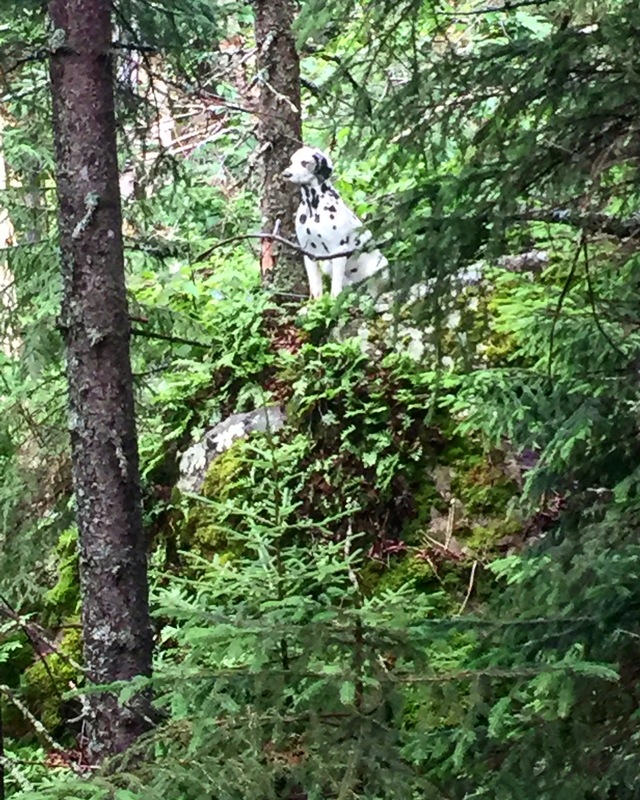 a Dalmatian sitting in the woods, on the top of a large boulder, overlooking the hikers going north and south! I took a double take and finally realized it was a statue! What a rare find! We are staying at the Logan Brook Lean-to tonight with a man named Westy. He has to be the most interesting man on earth! He had all the coolest, lightest weight gadgets, tons of great ideas and wisdom! His wife has been helping him slackpack at times and he is retired. I hope I can be as active as he is when I reach my later years! Keep hiking strong Westy! Well, that is it for now, because this has become quite long! I will have a second post of the rest of our adventures of the 100 mile wilderness and the AT to come. If you are interested in seeing more pictures, please take a look at my Instagram page. As always, thanks for following! Blisters are a bummer! I got a set my first day on the AT. They grew worse until a kind hiker soul showed me how to deal with them. After, rip-stop tape was my friend. (Do they even make that stuff anymore?) I used it to keep my heels protected from the heat of friction, and it worked mighty well. Maine … some fine hiking there. Enjoy!